Italian food is famous the world over. Every year thousands of people come to Italy eager to sample its food in its most authentic, flavoursome and tastiest form. Yet, and let’s be honest here, most of us lucky to travel to or live in Italy do so on a budget. So it is quite impossible to eat out daily at expensive restaurants that offer the most amazing Italian food ever. What to do then?! Well, the good thing about Italy is that excellent food here is not something reserved just for those with deep pockets. Eating well in Italy is like a national pride and joy. For Italians, it’s both an expectation and an obligation to nourish their bodies well. As such, anywhere you go in Italy, you can easily come across some very good food that is very reasonably priced. You just need to know where to look. As it is equally easy to come across awful food in Italy, especially in the perennial tourist hot spots. stuffing yourself with Italian street food – from Sicilian rice balls called arancini to Venetian soft-bread crustless sandwiches called tramezzini. Right at the end of this blog post you will also find my first-hand tried and tested practical tips to make eating well and cheaply in Italy even easier for you. This is followed by a list with links to other blog posts and videos of mine which will help you delve even deeper in the world of Italian food and the places where you can enjoy it without breaking the bank. I hope that all this information will come in handy during your exploration of Italy and the ever delicious and wonderful world of Italian food. The best way to get introduced to a large number of Italian foodstuffs and to sample them all is to head to one of the huge Italian food fairs which are regularly held all over Italy. Food fairs here can attract hundreds of food exhibitors – from small cottage businesses and organic farms to medium and large size food producers specialising in a particular product. You can easily spend half or even a whole day browsing the many stalls and learning about regional and rare Italian foods: from rosemary-covered cheese to bergamot juice, from organic honey and quince jam to wild boar and venison sausages. Plus, the largest Italian food fairs usually have an accompanying programme of food-related talks, cooking classes and meet-and-greets with artisan producers. It is a great chance to learn everything and anything you have ever wanted to know about proper, regional and artisan Italian food. You can also read my blog post about one of the largest food fairs in Italy – CosmoFood Fair – which is held in Vicenza every November. 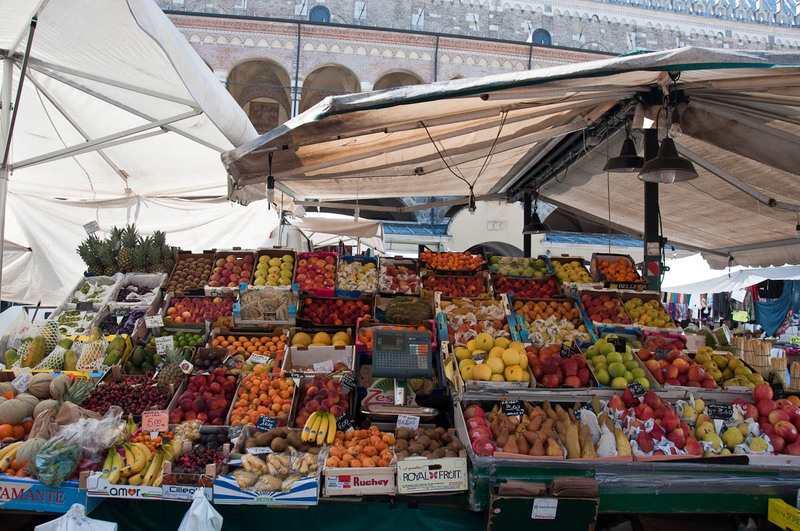 Food markets abound all over Italy. They are such an important and traditional part of Italy’s fabric as Italian art and music. Every Italian village and town has a food market at least once a week. In the largest Italian cities like Bologna, for example, there will be both a permanent food market which is open every day and weekly food markets. Check the local listings or ask at the local tourist office to find out their location and opening hours. At Italian food markets, you can buy both fresh and cooked food. From 0 km fruit and veg produced by local farms to freshly fried seafood, from a large variety of cheeses and salami to fresh and ground spices and thick, tasty honey, the choice really is yours. You can grab products for a nice home-made dinner (if your accommodation in Italy is equipped with cooking facilities) or for a nice picnic to take with you when you go nature hiking or to the beach. The market traders will also give you lots of tips about how to cook a particular Italian vegetable that you may not be familiar with. Like broccolo fiolaro, white asparagus or romanesco broccoli. 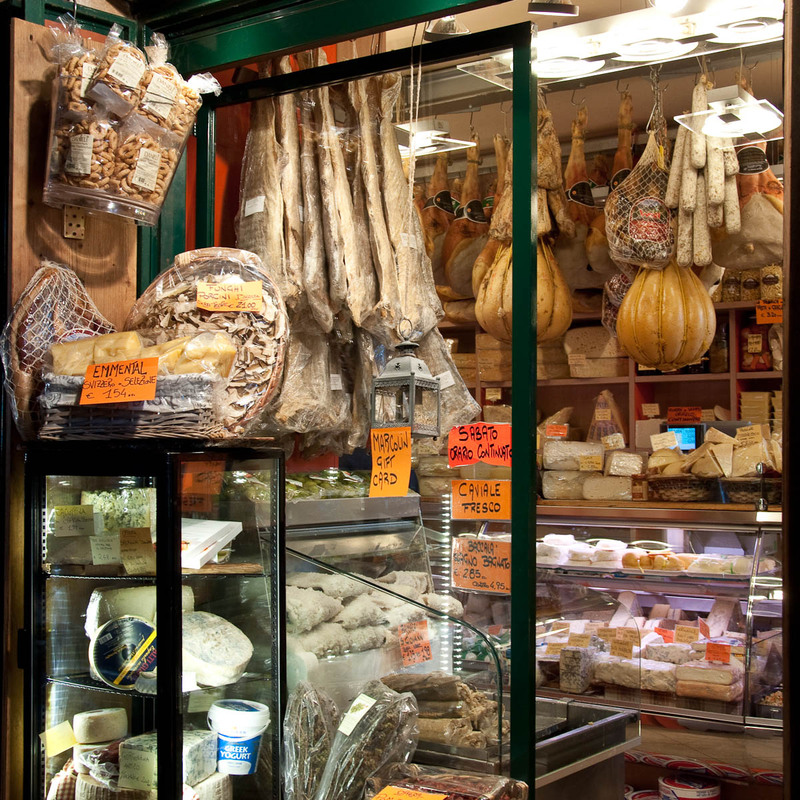 Many of the food markets you will come across during your stay in Italy have been going on strong for centuries. Like the Rialto Fish Market in Venice and the daily market in Padua. Visiting them is like experiencing living history, so don’t miss it for the world. 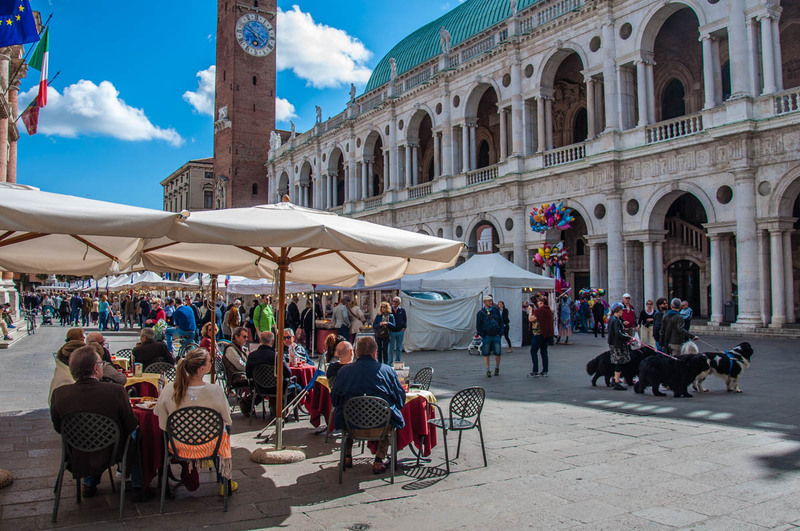 On weekends you can often come across large food festivals taking place in the historical centres of Italian cities and towns. There will be a party atmosphere and from a dozen to a hundred stalls selling all sorts of regional Italian food. porchetta – roasted pork sold in thick slices wedged in a crusty panino bread roll. By navigating from stall to stall and buying a little bit here and there, you will be able to curate a rather nice and lavish meal. It needs to be said that alongside the Italian food festivals selling all sorts of eclectic food, there are also specialised food festivals in Italy which are dedicated to a particular foodstuff. 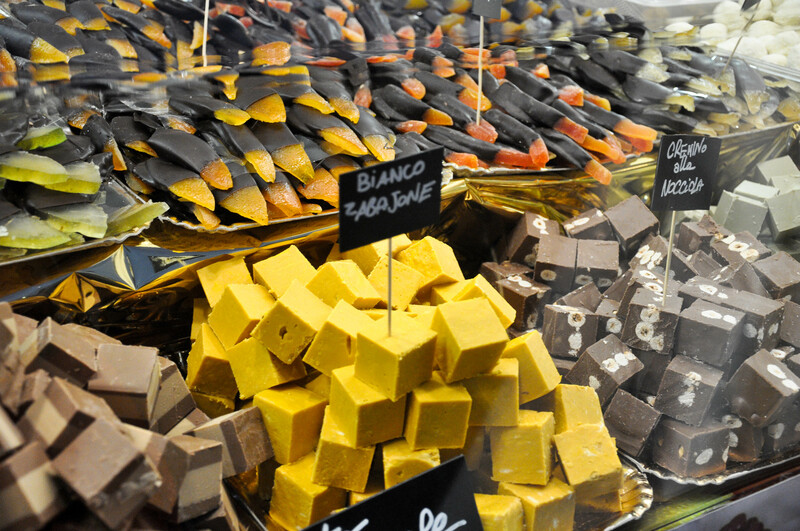 Like the chocolate fairs held all over the country or the nougat fairs held in Cremona and Cologna Veneto. Ask at your hotel or the local tourist office for the dates and times of any food festivals to take place during your stay in Italy. Food festivals are either an event on their own or are held parallel to another large event in Italian towns and cities. For example, come Christmas, you will find dozens of stalls selling Italian food as part of the traditional Christmas markets here. Now, eating on the go is not really the done thing here in Italy. The Italians have this notion of bella figura by which they live. Running around with a burger or a sandwich in hand messes up too much with their idea of looking absolutely perfect at all times. pizza al taglio (also known as pizza al trancio) – this is pizza sold in slices. The price can be by the slice or by weight. Usually, there will be two price points – the cheaper one will be for pizza Margherita and the slightly more expensive one for pizza farcita (i.e. pizza with toppings). 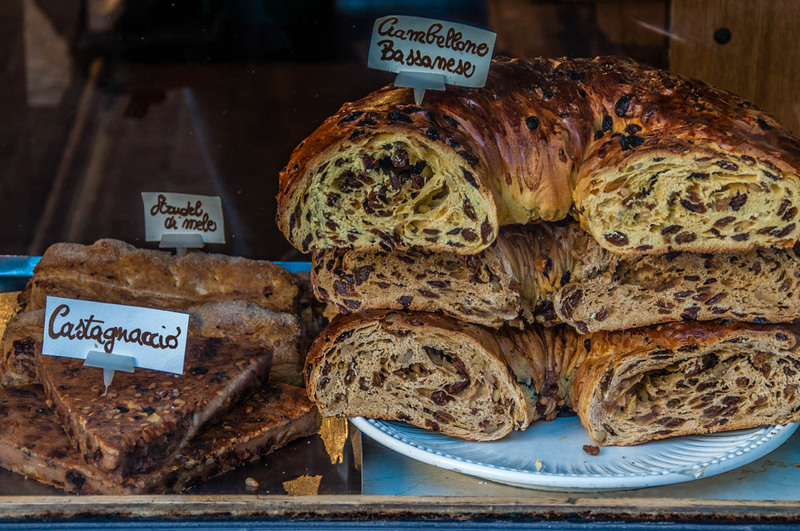 These Italian street foods are traditionally sold in bars and cafes all over the country but also in food shops of the hole-in-a-wall variety. There are also many eateries specialised in one of the above street foods. For example, you may come across a tramezzineria or a piadineria or a panineria. Just know that these are small and, usually, inexpensive places where you can treat yourself to a variety of traditional Italian sandwiches and have an authentic experience without breaking the bank. A tramezzino can cost as little as 1.20 euros while a nice focaccia will vary between 3 and 5 euros for a large piece. 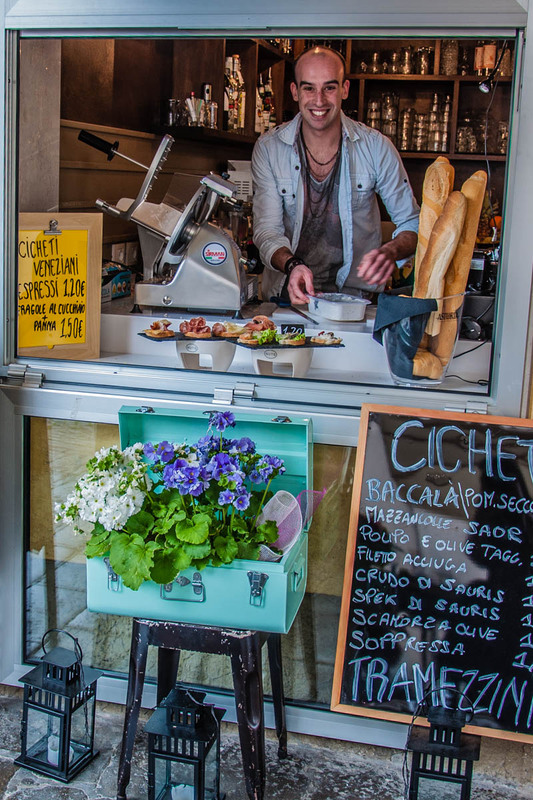 Food trucks are getting increasingly popular in Italy, too. Food truck festivals are now regularly organised around the country. Either ask at the local tourist office or keep an eye on Facebook Events (see how in point 1 in this list) to uncover any food truck events that may be taking place during your visit to the country. The ones held each year in Mantua and Bassano del Grappa are quite popular but there are many others, too. An Italian bar is rather different from its British counterpart. In so that people pop in an Italian bar to have their morning coffee as well as some food at mealtimes. Alcohol is still being sold but it is just one of the many things on offer. Plus, no-one will think badly of you if you bring your children to an Italian bar to have something to eat. An Italian bar is like an equal parts mixture of a coffee shop, a breakfast/lunch joint and an actual bar. It’s like a cafe with a twist. You can find all sorts of Italian sandwiches and stuffed Italian bread (panini, piadine, tramezzini, focacce, etc.) in an Italian bar and/or cafe. There may also be some salads made with a variety of ingredients like fresh salad leaves, grilled vegetables, mozzarella cheese, olives, tuna fish and so on. There may be warm meals cooked and served at lunch and in the evening. Often, there is a big blackboard announcing the day’s specials. Usually, the food is proudly showcased in large plates and bowls in a display cooler. Once you order, the sandwiches will be grilled and the food warmed up. If you don’t see a display cooler, ask if the food the place sells is microwaved from frozen. If the answer is affirmative, then look for another small bar/eaterie where they actually cook their meals on the premises. 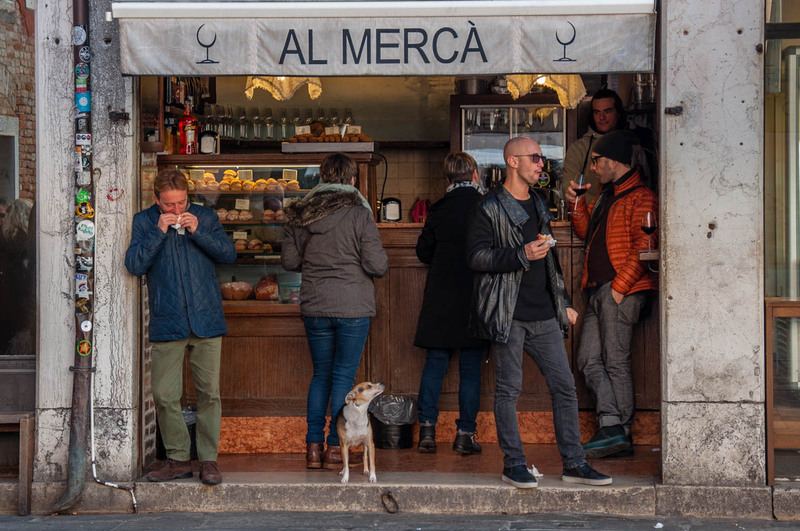 I particularly love exploring the small bars that have mushroomed around Italy’s historical food markets. For example, there is this tiny little bar that is just opposite Palazzo della Ragione and the 800-years old food market in Padua. Most times that I pop down to Padua, I will have at least a coffee in this little unpretentious bar while watching the hustle and bustle of the daily market. They also serve some of the best light bites. 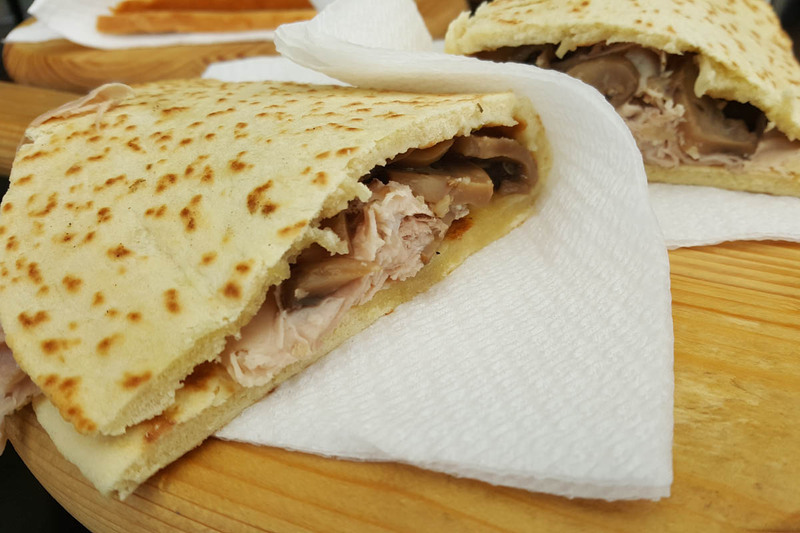 Their piadina stuffed with sliced meat and roasted potatoes is one of the most delicious things I have ever had. In Venice look for one of the dozens bacari (see the picture above). 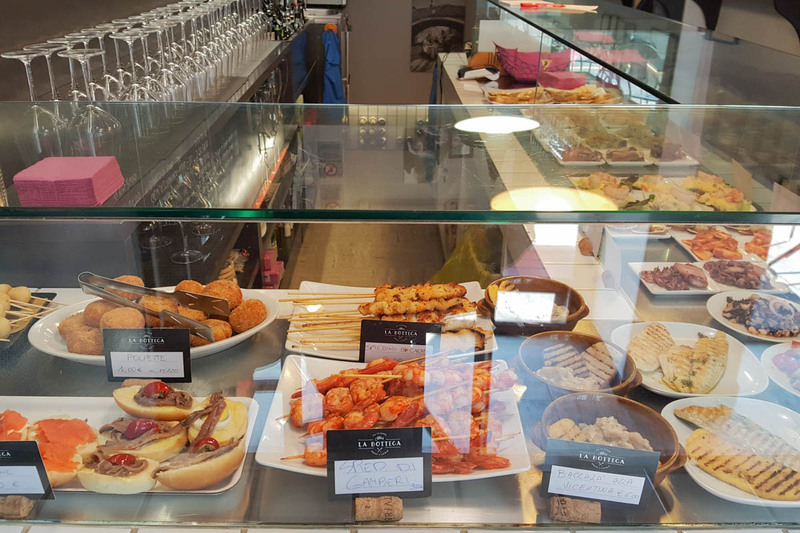 These are tiny little bars which serve wine by the glass (called ombra in the local dialect) and a mouth-watering selection of cicchetti – Venetian finger food. Some of the Venetian bacari are centuries-old and still going strong. Unfortunately, I have to warn you that it is very easy to have bad food in Venice. I have to admit that I once had there what could be described as the worst meal of my lifetime. It was a plate of reheated maccheroni with tomato sauce. It was incredible how this very simple dish was so wrong on so many levels with its watery sauce and lukewarm pasta. I may come across as small-minded but I still begrudge the seven euros I paid for it, the meal was so disgusting. So, yep, lesson learned. 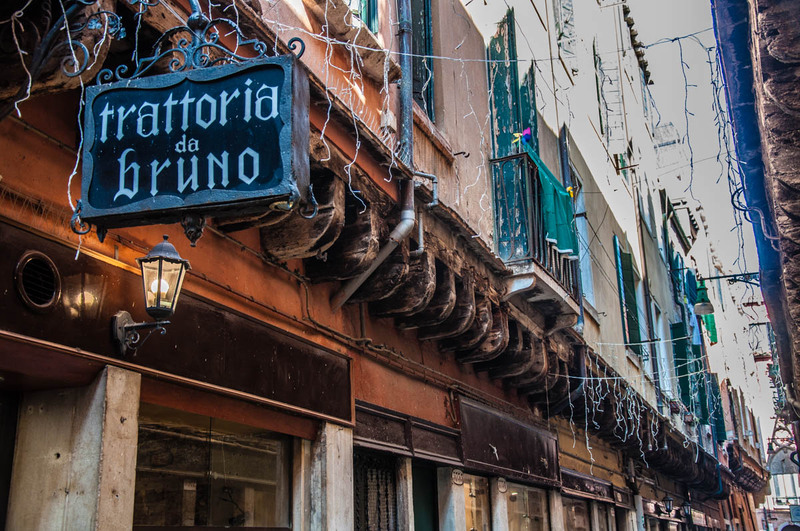 For a tasty local meal that doesn’t break the bank in Venice, head to an authentic bacaro or a small bar that is outside of the active tourist zone. Trattoria – traditionally, this is a family-owned eaterie where home-cooked food is served. It’s an unpretentious place where you can eat seasonal fresh food reflecting the local culinary customs. Osteria – originally, you would go to an osteria to have a glass of wine and the food would be simple and more of an after-thought. This has changed somewhat and nowadays more attention is given to food. Yet, an osteria continues to be a simple eaterie where you can eat well on wooden tables and in simple rustic surroundings. The menu will be very short and ideally would change daily depending on the seasons and what’s available on the local fruit and veg market. Enoteca – obviously this is a place where the emphasis is entirely on the wine. Some appetisers will be served as Italians usually don’t drink without a light bite to nibble on. Depending on where you find yourself in Italy, you can expect to pay as little as a 5-6 euros for a starter and 8-10 euros for a main meal in one of these three types of traditional Italian eateries. Depending on your appetite, you can have a very lavish five-course meal for 20-25 euros or a smaller meal with two courses for 10-15 euros. Osterie d’Italia – independently researched and published by Slow Food. Click here for a list with the names of the recommended osterias. Now, Italy has some amazing restaurants with Michelin stars, sommelier service and refined menus. It’s nice to visit one of these establishments every now and then. It really could be the experience of a lifetime. The rest of the time and especially when travelling money is a bit tight, I suggest that you look into exploring another of Italy’s culinary traditions. That of the self-service restaurants. Very similar to a student canteen, these are places where you help yourself to a selection of pre-plated food, put it all on your tray, pay the cashier and then you make yourself comfie on one of the available tables and happily tuck in. The most extraordinary self-service restaurant in Italy I have been to is called Righetti. You will find it in Vicenza, Northern Italy where Righetti is something of an institution. 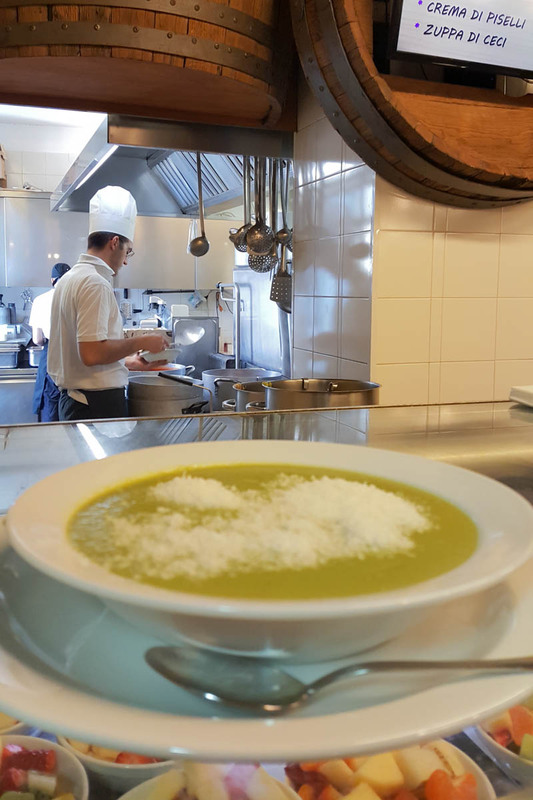 The restaurant is so popular that at lunchtime and dinnertime its five rooms get full with people eager to fill their bellies with the delicious and freshly cooked local food. Prices are very reasonable and the most amazing thing is that Righetti is an honest restaurant. This means that you help yourself to the dishes you fancy, enjoy them at your table and then you go to the cashier and tell him what you just had. He tells you the total and you pay. That’s it! 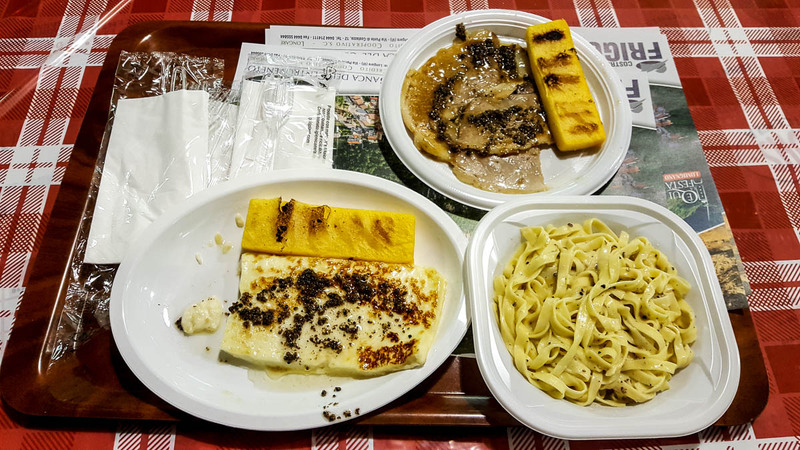 Another way to eat freshly cooked, local and inexpensive food in Italy is to head to the nearest agriturismo. Agriturismos are independent farms in Italy which may offer accommodation and/or food on their premises. Prices tend to be very affordable. Food is seasonal. The ingredients – veg, meat, dairy and fruit – come straight from the farm. Most agriturismos (actually, the correct plural form in Italian is agriturismi) have a large restaurant attached to them. The menu will be simple, often there won’t even be a written menu but the waiter will simply tell you what that evening dishes are. There are hundreds of agriturismos dotted around the Italian countryside. Ask at the local tourist information office which are the most popular ones for the food they serve. Or you can even book to stay in one. As agriturismos are outside of city and town centres and in the countryside, most probably, you will need a car to get to them and their restaurants. Also, the kitchen most usually is only open for lunch and dinner service on weekends and just dinner service on weekdays. The rest of the time the restaurant may just serve coffee and some desserts or it may simply be closed. It’s best to always check in advance so as not to be disappointed. Often, fresh food (like locally grown veg and fruit, honey, salami, cheeses, etc.) are sold on site, so you can stock up for picnics or to cook at your accommodation. 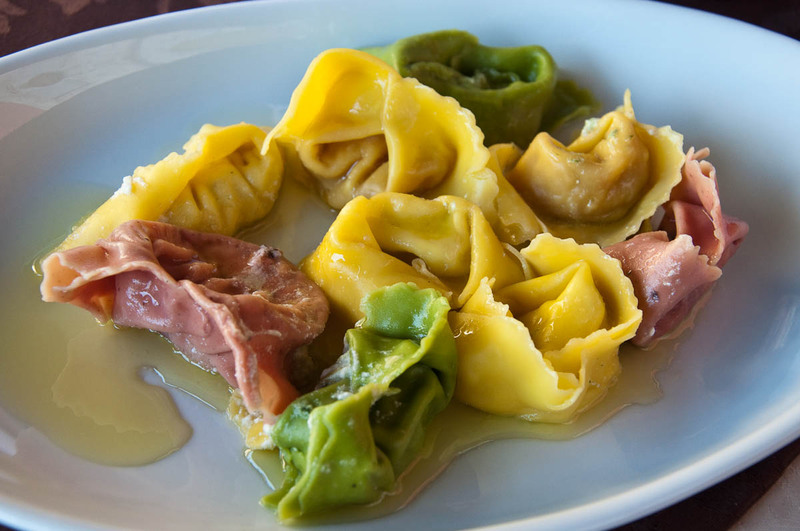 Sagras are Italy’s best-kept food secret. Fear not! I am about to reveal it all to you so that you can do like the Italians and eat like a king for a very reasonable price. 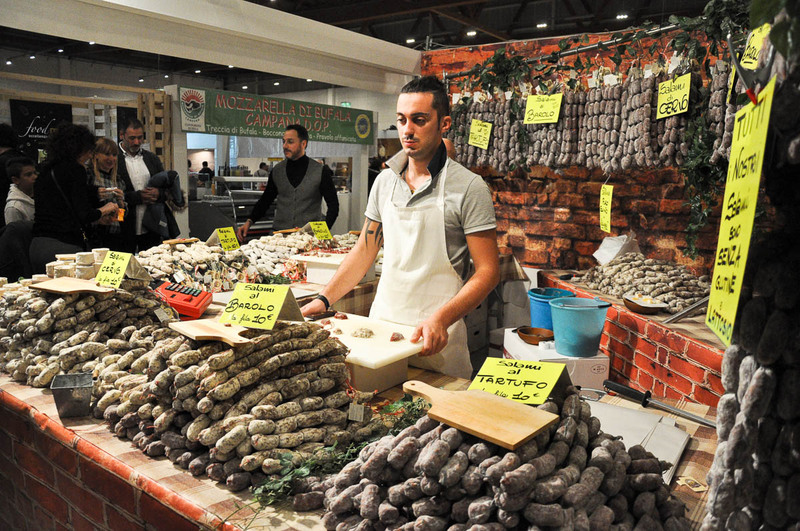 A sagra is a food festival dedicated to a particular, locally produced foodstuff. This could be peas, white asparagus, cherries, a particular type of cheese. You get the drift. All dishes served at the sagra will incorporate in one way or another said foodstuff. For example, at the pea sagra we went to a few years back, there were dishes such as rice with peas (risi e bisi), lasagna with peas, stew with peas, porchetta (roasted pork) with peas, etc. The food is prepared by a group of local volunteers and it is some of the best food you will have a chance to taste in Italy. It is all served in disposable plates on long wooden tables under huge white marquees. There are hundreds of people eating and milling around. It’s noisy and convivial. Often there are also several accompanying events like live music and dancing, a raffle, fairground rides, etc. All in all, it is a great evening out for both singles and families with kids. Prices are from 4 to 10 euros per portion with some cheaper options like chips and panini being sold for a couple of euros. Often, you would also be able to buy rather inexpensively the foodstuff to which the sagra is dedicated. For example, large juicy locally-grown cherries for 5 euros per kilo or fresh truffles for a few euros a piece. If you have a chance to go to a proper locally organised sagra in Italy, grab it with both hands. Apericena is a happy tasty amalgamation of an aperitif (in Italian aperitivo) and dinner (in Italian cena). 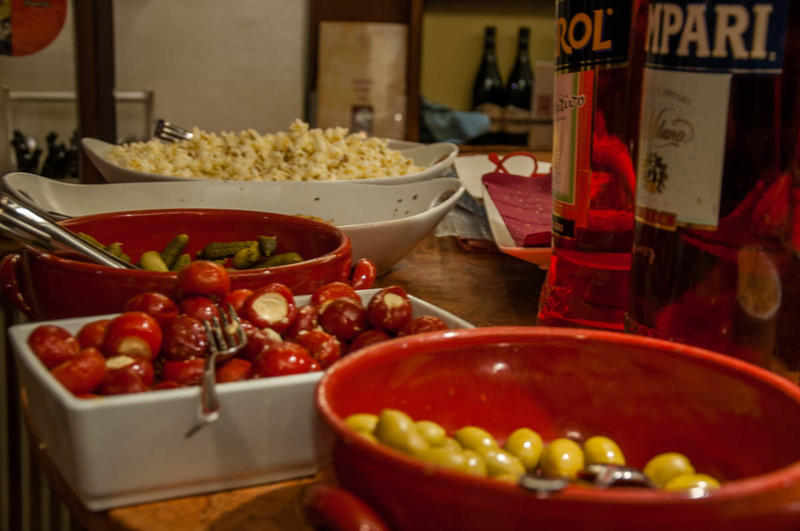 In Italy aperitivo is traditionally served with a small selection of finger foods – nuts, crisps, olives and small cold bites, as Italians dislike having a drink on its own without lining up the stomach at the same time. In the last few years, the habit of serving these little Italian mezzes has evolved dramatically. Nowadays some bars offer lavish buffet-style meals to accompany the drinks that you order. You pay something like ten euros for a drink and unrestricted access to a spread of cold and hot dishes. 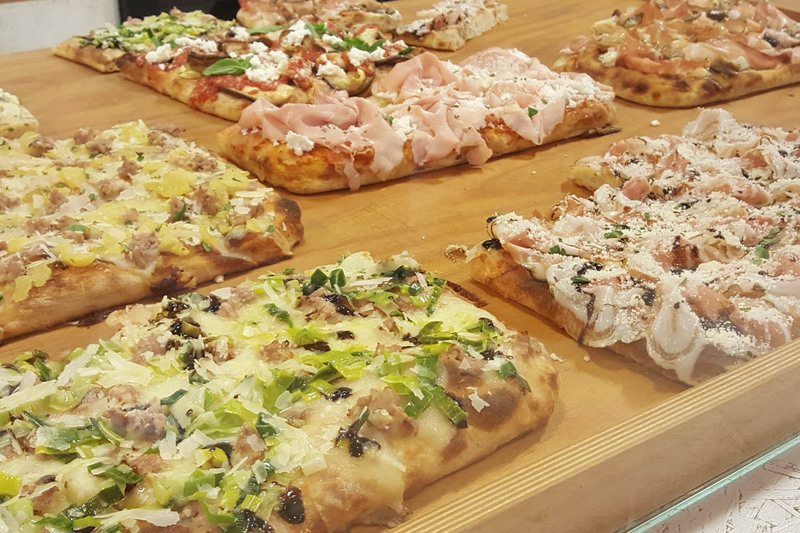 You are in Italy after all so stuff yourself with pizza! So, take any chance to eat pizza. For recommendations where to go and what to order, it’s best to ask the locals. There could be two pizza places within fifty meters of one another and, yet, you may quickly notice that the locals go to one and not the other. Italians don’t compromise with the quality of their food. So, definitely follow the crowd on this one and head to the pizza place – a takeaway joint or a sit down inexpensive restaurant – that is visited by the locals. You can expect to pay as little as 4 euros for a simple pizza Margherita at a takeaway place and 6-7 euros for pizzas with more and fancier toppings like chiodini mushrooms. In cheap pizza restaurants prices will be a euro or two higher and you will have to pay a couple of euros for the coperto charge (a typical for Italy cover charge paid by each person around the table). Yet, it is still perfectly possible to have a great unpretentious pizza-based lunch or dinner for about ten euros per head. 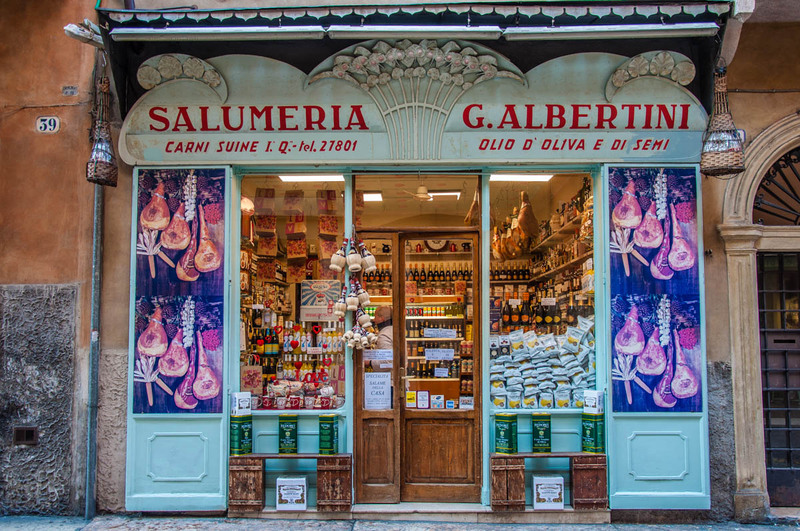 Italy is the country of exquisitely beautiful deli shops where each product is arranged in the most sublimely mouthwatering fashion. Whole legs of prosciutto will be hanging from the ceilings, large rounds of cheese will be stacked high up by the counter, olives will be swimming in glistening oil and rows upon rows of jars with pickles and sauces will be lined up neatly on the shelves. Take your pick! Not to mention the many bakeries, butchers’, fruit and veg shops and all sorts of small businesses that make it their goal in life to sell nothing but good Italian food. Don’t be afraid to go into one of these temples of food even though you may not speak Italian or don’t know your finocchiona from your sopressa. 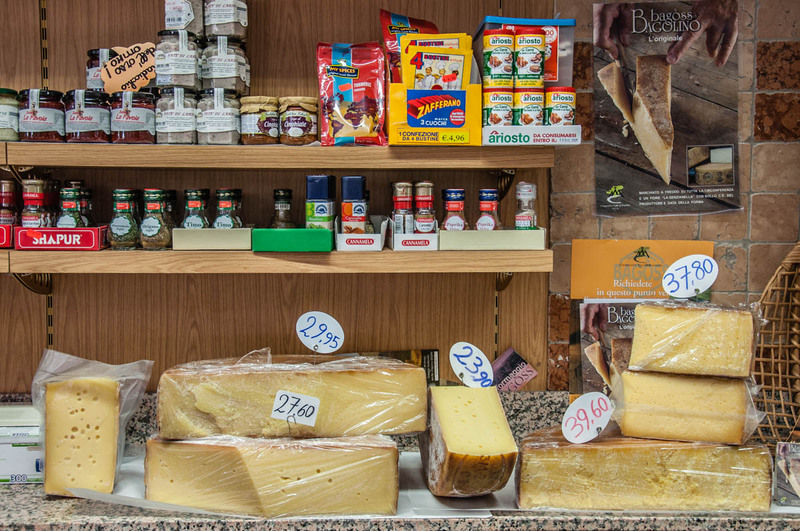 Italian shopkeepers are only too happy to recommend different things and to explain where each foodstuff they proudly stock comes from, how it was made and what it should be eaten with. A local deli or a bakery owner will also happily make you a panino (bread roll) generously stuffed with thinly sliced salami or prosciutto and a generous slab of local cheese. This may not be on the menu or advertised anywhere in the shop, but it is an established practice, so don’t be afraid to ask, especially if you are after some nice quick lunch or picnic supplies. Expect to pay between 2 and 4 euros per stuffed panino depending on the place. 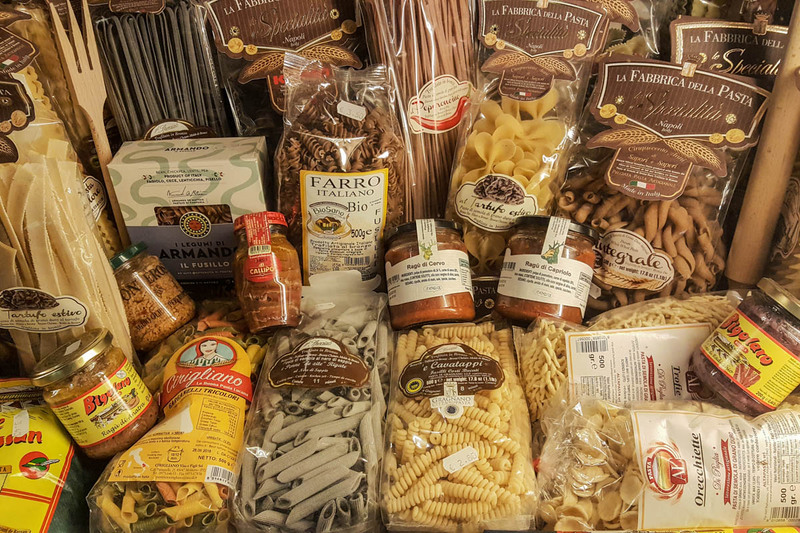 Even if you are a die-hard foodie, don’t turn your nose up at Italian supermarkets. 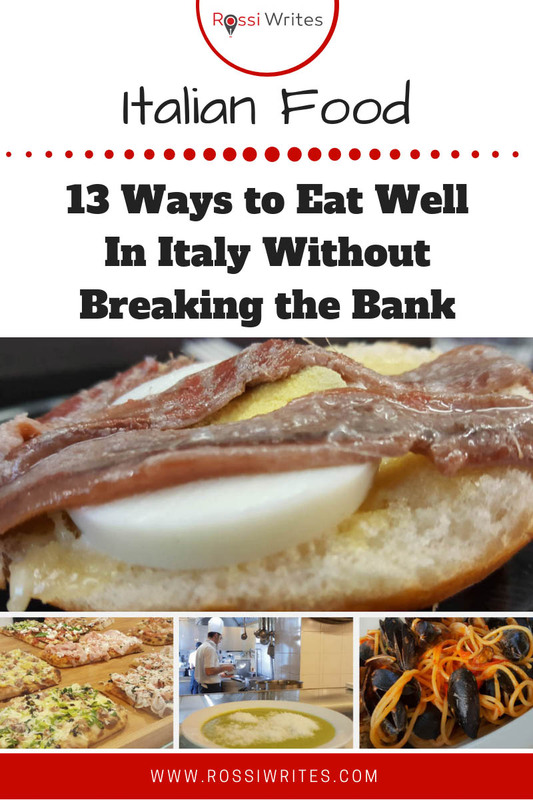 Especially if you are on a budget and can’t eat out every day during your stay in Italy. Italian supermarkets are rather nice in so that they sell a tiny variety of pre-packaged and frozen meals and a huge selection of local cheeses, salami, meats, seafood, fruit and veg and all sorts of ingredients to cook up a storm. Plus, the people manning the deli, meat and seafood counters can give you some great culinary advice on how to prepare this or that the proper Italian way. So, yes, if you have a chance and especially if your accommodation comes with cooking facilities, head over to the nearest Italian supermarket and stock on some beautiful olive oil, fresh seasonal produce and whatever else your little foodie heart desires. It will be a great lesson in real Italian life and an experience in real Italian food. Some big name supermarkets here in Italy are: Emisfero, Rossetto and Famila. There are many more though, so see what’s available in the Italian city, town or village you find yourself in. 1. Always ask the locals for recommendations. It could be the nice receptionist at your hotel, the owner of the rented apartment you are staying in, the little group of old ladies chattering on the street, the shopkeeper selling newspapers and chewing gum, the Italians you have sat next to on a long train journey. Good food is a national passion in Italy and everyone – irrelevant of age and social status – can point you in the right direction and reveal some hidden culinary gems. 2. Don’t judge an eaterie on its size or lack of lavish decors. Some of the most memorable meals in Italy are often eaten in very humble surroundings. Instead, observe how full the place is with local people. As well as how welcoming and emotionally warm it feels. 3. Walk away from a place if you see or suspect that the food is microwaved. Honestly, with so much delicious fresh food being cooked and served all over Italy, don’t waste any meals and any money on microwaved fodder. 4. Often, in bars and eateries, it may be cheaper to have the food to go. You may be charged a slightly more expensive price if you sit at a table. 5. 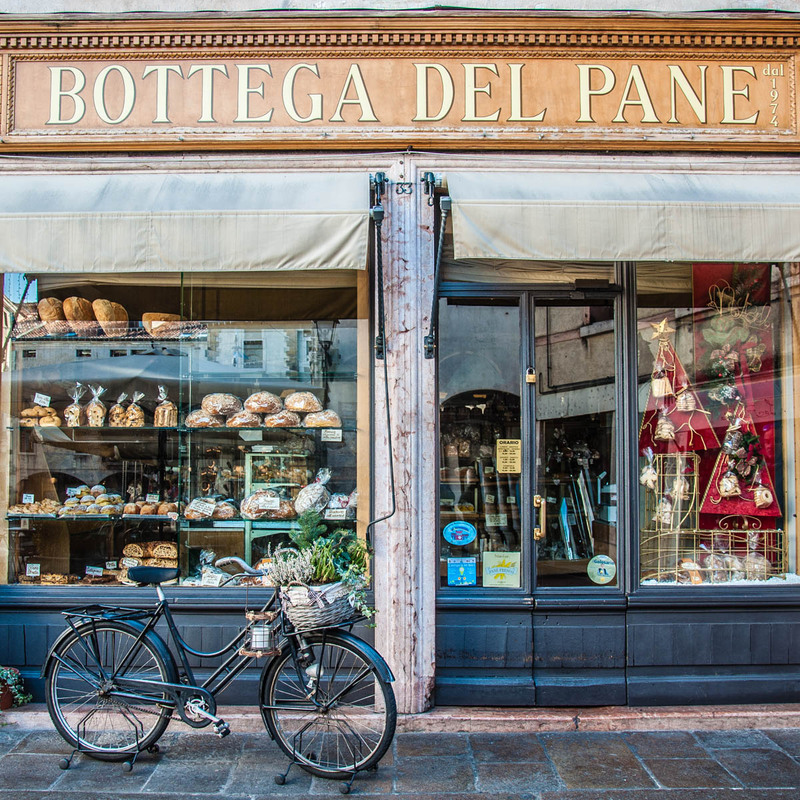 Find out what’s typical for the region and the city/town of Italy you are visiting. Food in Italy is incredibly varied with each region and province having its own rich culinary tradition. As such eat pizza in Naples and cicchetti in Venice. Not vice-versa! 6. Don’t be surprised if you are charged more for a fizzy drink than for a tramezzino or panino. Fizzy drinks and fruit juices are rather pricey in Italy. You would be better off (and would fit better culturally) if you order a glass of water or wine with your meal. 7. Make sure that you read this blog post with 101 tips for Italy you need to know before you travel to Italy. Pay special attention to tips from 32 to 67. They will prepare you well in terms of Italian food and Italian culinary culture. Eating well in Italy is not equal to spending the most money at the most lavish of restaurants. Good food is sacrosanct in Italy and it is firmly believed that everyone has the right to it. As such you can find beautifully prepared, fresh, local food that doesn’t cost an arm and leg in all sorts of places and establishments in Italy – from small traditional bars to large supermarkets. 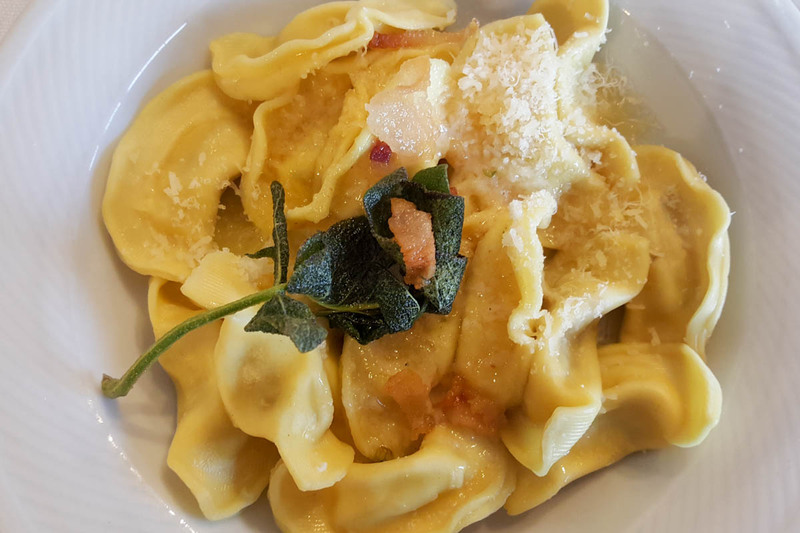 Use my first-hand tried and tested tips and suggestions in the article above to find the best places to eat affordably when in Italy. Being on a budget when you travel doesn’t mean you have to cut corners when it comes to proper, real Italian food. What was the most memorable meal you ever had in Italy? What other nice and affordable food places you can recommend to fellow travellers to visit in Italy?